Take your home search to the next level by searching through our easy to use MLS website. Welcome to www.Sold757.com with the Houser Home Team, your online source of information and services for buying or selling Real Estate in Hampton Roads. With years of combined local experience, we know the Hampton Roads real estate market and our goal is to guide you with with friendly, knowledgable and professional representation with a focus on client satisfaction and your bottom line. Are you interested in buying or selling property in Hampton Roads, Va? Let our team of talented local professional Realtors help you with your next move. Contact us today. 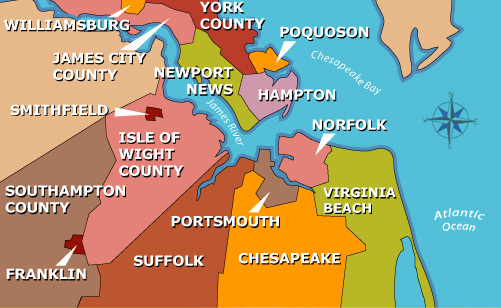 Hampton Roads also known as Coastal VA, is the name for the Norfolk-Virginia Beach metropolitan area in southeastern Virginia made up of several municipalities. It is home to the United States Navy, Marine, Air Force and Army bases along with thier military families. Hampton Roads is also home to NASA and Northrop Grumman Shipbuilding and is a great community for new businesses. Also know for its vast historical landmarks and miles of beaches it, provides a well rounded place to call home. What you can expect from our site. Price changes emailed to you. New listings emailed to you.